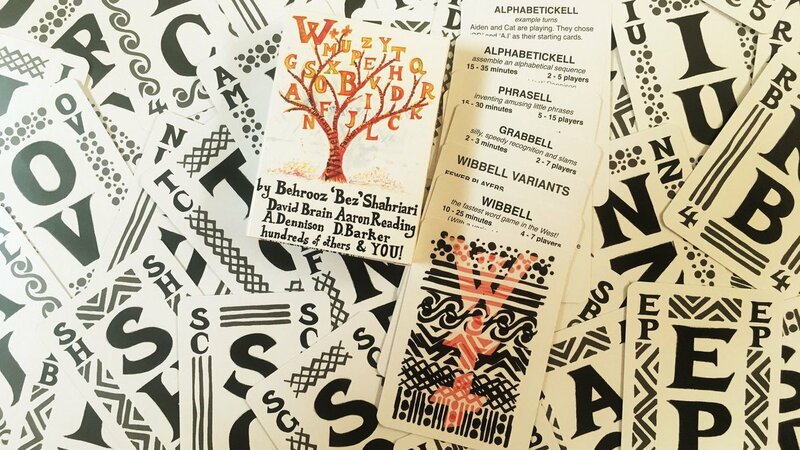 Although Blether, has been put on hold designer Bez is still beavering away at numerous other projects and her next release is Wibell++ a deck of cards with letters, numbers and patterns on it that contains one core game, Wibell and 4 other games. A recent successful crowdfunding campaign will see a website setup to support other games using the same deck, turning this into a ‘game system’. Let’s look at the first game in the box, and the one that started this whole idea off for Bez. Wibbell is a multiplayer word making game that is very fast playing. With up to 7 players you deal out two cards in the centre of the table for a total of 4 letters. The first person to shout out a word using a letter from both cards, takes one of those cards, flips over a new one to replace it and a new round begins. The person who gained a card now not only has to include letters from the cards in the middle, but also the ones in front of them. This is a neat mechanic that lets players catch up and makes the game feel nice and even throughout. Once a player has gathered 4 cards in front of them, everyone gathers the cards they have collected so far and puts them in a stack. A new round start afresh and so the game goes. Once all the cards have been used up you count up the number of cards that everyone has and the player with the most is the winner. Wibbell is a fast playing, fun game that is a good ice breaker for a night of gaming and we had a good laugh with it. We did run into a couple of problems where words could be repeated to win multiple rounds on the run, but I guess you can just self regulate that. Now let’s turn our attetion to the other games in the box, only one of which I have had a chance to play. Alphabetickell is a game of putting letters in sequence. Each player gets to pick one of 3 cards as their starting card. One player will kick the game off by turning over the next card in the deck and accepting it onto either end of their line or passing on it. If they pass then the next player can add it to their line or pass and so on. Any card rejected by everyone is discarded. This goes on until one player adds the 11th card to their line or the deck runs out and then each player scores 1 point for each card in their line. Over several rounds the first player to 26 points is the winner. I really didn’t enjoy Alphabetickell. I can see players making mistakes a little the first couple of times they play it but it never really felt like their was any real decisions to be made here. Either each card was great for me and I took it, or it wasn’t and I passed. I couldn’t really trick people into taking a card, or strategise at all, it just left me feeling cold. I haven’t played the other games in the deck so I am not going to go anywhere near reviewing them, but none of them really grabbed me from their description. Grabbell just seemed like a less good version of Dobble, a game I love. Phrasell is about making silly phrases which might pass the time and be a good ice breaker like Wibbell, and Faybell is a storytelling prompt which I can see being fun with the right group. Honestly I don’t see how much more can be got mechanically out of this set of cards, though I am happy to be proved wrong. Although I think Wibbell is a perfectly decent game I think Bez’s desire to turn it into a ‘game system’ is a bit ambitious and the core game would have been the better one to focus on. I have a problem with a lot of the ‘party’ games I am seeing on Kickstarter at the moment in that a lot of them don’t really hit the ‘game’ part for me very well. They can be an amusing thing to do for a while but there are no real mechanics, no oomph to them that make me want to play them again and again, unlike something like Mafia de Cuba (I’ll review that one soon) which gives you really interesting choices behind the facade of a party game. This is where a lot of the Wibbell++ deck falls down for me. The core game is perfectly good, if a little light for my taste. The rest of the games feel very tacked on and don’t really shine at all and I think that buries the core game and makes it lose it’s appeal. If you are looking for a light, wordy icebreaker for games night then buy this for Wibbell, just don’t expect a lot from the other ‘games’ in the box. Thanks for the review, Iain! In the FAQs, it does mention that you are not allowed “words already used to take cards this game, nor derivatives of those words”. This is intended to prevent exactly that problem you mention. I apologise for the rules not being clearer. It’s very possible I could have presented them in a better manner and hopefully I can continue to improve and learn from your comments.